Launch preparations were in full swing today on Florida’s Space Coast for liftoff of the hi tech USAF X-37B reusable spaceplane- hoping to escape to orbit for the first time atop a SpaceX Falcon 9 rocket and just in the nick of time tomorrow, before the impending threat of monster storm Irma potentially lashes the launch pad at NASA’s Kennedy Space Center in the center of the states long peninsula. Irma is packing winds of 185 mph and one of the strongest Atlantic storms ever. It is being closely tracked in incredibly high resolution by the new NASA/NOAA GOES-16 (GOES-R) satellite launched late last year on a ULA Atlas V in Nov 2016. I witnessed the entire SpaceX Falcon 9 rocket and payload stack being rolled horizontally up the incline to the top of Launch Complex 39A late this afternoon, Sept. 6, during our media visit for up-close camera setup. Rather remarkably the relatively dismal weather forecast has brightened considerably in the final hours leading to Thursday’s scheduled launch and the forecast heavy rain showers and thunder have dissipated in the time remaining between now and liftoff. The X-37B reusable mini-shuttle is a secretive technology testing spaceplane flying on its fifth mission overall. The path to launch was cleared following the successful engine test firing of the Falcon 9 first stage I witnessed late last week, Thursday afternoon, Aug. 30. During the hold down static fire test all nine Merlin 9 stage engine were ignited and fired up to full throttle for several seconds. See my static fire story here. Although the exact launch time remains a closely guarded U.S. Air Force secret, liftoff of the X-37B is slated to occur sometime during a 5 hour long window. The launch window for the X-37B on the OTV-5 mission opens at 9:50 a.m. EDT (13:50 UTC) and spans until 2:55 p.m. EDT (18:55 UTC) Sept. 7 from seaside Launch Complex 39A on NASA’s Kennedy Space Center. SpaceX will offer their own live webcast beginning approximately 15 minutes before launch starting at about 9:35 a.m. EDT. In the event of delay for any reason, the next launch opportunity is Friday, Sept 8 at approximately the same time and window. However amidst the heavy duty Hurricane Irma preparations all around, nothing is certain. Local area schools in Brevard County have closed and local residents are preparing their homes and apartments to hunker down, buying food and essentials putting up storm shutters, topping off gas and energy supplies and more. “If for any reason we cannot launch tomorrow we will reevaluate whether or not we can still support another attempt on Friday, said Wayne R. Monteith, Brig Gen, USAF, Commander, 45th Space Wing. The weather forecast overall is about 50% chance of favorable conditions at launch time according to U.S. Air Force meteorologists with the 45th Space Wing Weather Squadron at Patrick Air Force Base. But the opportunity varies within the long window and the exact launch time is currently classified. “Hurricane Irma is forecast to be approximately 900 miles southeast of the Spaceport during Thursday’s launch attempt, so while Irma certainly bears watching, the stalled boundary will be the main factor in Thursday’s weather,” noted the 45th Space Wing Weather Squadron. The primary concerns on Sept. 7 are for cumulus clouds and for thick clouds in the flight path. Everything is currently on track for Thursday’s launch of the 230 foot tall SpaceX Falcon 9 on the X-37B OTV-5 mission. “The Air Force Rapid Capabilities Office is undergoing final launch preparations for the fifth mission of the X-37B Orbital Test Vehicle [OTV],” the Secretary of the Air Force Public Affairs announced. “The OTV is scheduled to launch on Sept. 7, 2017, onboard a SpaceX Falcon 9 launch vehicle. The X-37B will be launched for the fifth time on the OTV-5 mission atop a SpaceX Falcon 9 on Sept. 7 from Launch Complex 39A on the Kennedy Space Center Florida into low Earth orbit. The Boeing-built X-37B is processed for flight at KSC using refurbished NASA space shuttle processing facilities now dedicated to the reusable mini-shuttle, also known as the Orbital Test Vehicle (OTV). It launches vertically like a satellite but lands horizontally like an airplane and functions as a reliable and reusable space test platform for the U.S. Air Force. The OTV-5 mission marks the first launch of an X-37B spaceplane by SpaceX. All four prior OTV missions launched on the United Launch Alliance Atlas V and ended with runway landings in either California or Florida. “The many firsts on this mission make the upcoming OTV launch a milestone for the program,” said Randy Walden, the director of the Air Force Rapid Capabilities Office. SpaceX will also attempt another land landing of the 156-foot-tall Falcon 9 first stage back at Landing Zone-1 (LZ-1) at the Cape. The Falcon 9 first stage is equipped with a quartet of landing legs and grid fins to enable the rocket recycling plan. This marks the 7th time SpaceX attempts a ground landing at the Cape. The booster will touch down about 8 minutes after launch and generate multiple sonic booms screaming loudly across the surrounding region and beyond. The daylight first stage precision guided landing should offer spectators a thrilling up close view of the rocket reusability technology envisioned by SpaceX’s billionaire CEO Elon Musk to drastically slash the high costs of launching to space. Technicians work on the Air Force X-37B Orbital Test Vehicle 4, which landed at NASA’s Kennedy Space Center Shuttle Landing Facility in Florida May 7, 2017. Credit: Secretary of the Air Force Public Affairs. The 11,000 pound (4990 kg) state-of -the art reusable OTV space plane is about a quarter the size of a NASA space shuttle. The vehicle measures 29 ft 3 in (8.9 m) in length with a wingspan of 14 ft 11 in (4.5 m). The X-37B was originally developed by NASA but was transferred to the Defense Advanced Research Projects Agency (DARPA) in 2004. Since then most but not all of the spaceplane’s goals have been shrouded in secrecy. KENNEDY SPACE CENTER, FL – GOES-R, the first in a new series of revolutionary NASA/NOAA geostationary weather satellites blasted off on an awesome nighttime launch to orbit this evening from the Florida Space Coast. Liftoff of the highly advanced Geostationary Operational Environmental Satellite-R (GOES-R) weather observatory bolted atop a ULA Atlas V rocket came at 6:42 p.m. EST on Saturday, Nov. 19, 2016 from Space Launch Complex 41 (SLC-41) on Cape Canaveral Air Force Station, Florida. The launch was delayed for an hour until the very end of the launch window to deal with unexpected technical and Eastern range issues, that only added more drama and changed the sunset launch into a night launch for the hordes of spectators who gathered here from around the world – appropriate since this probe will touch the lives of humans world wide. “It’s a dramatic leap in capability – like moving from black and white TV to HDTV,” explained Greg Mandt, the NOAA GOES-R program manager during a prelaunch media briefing in the cleanroom processing facility at Astrotech. “This is a very exciting time,” explained Greg Mandt, the NOAA GOES-R program manager during the Astrotech cleanroom briefing. 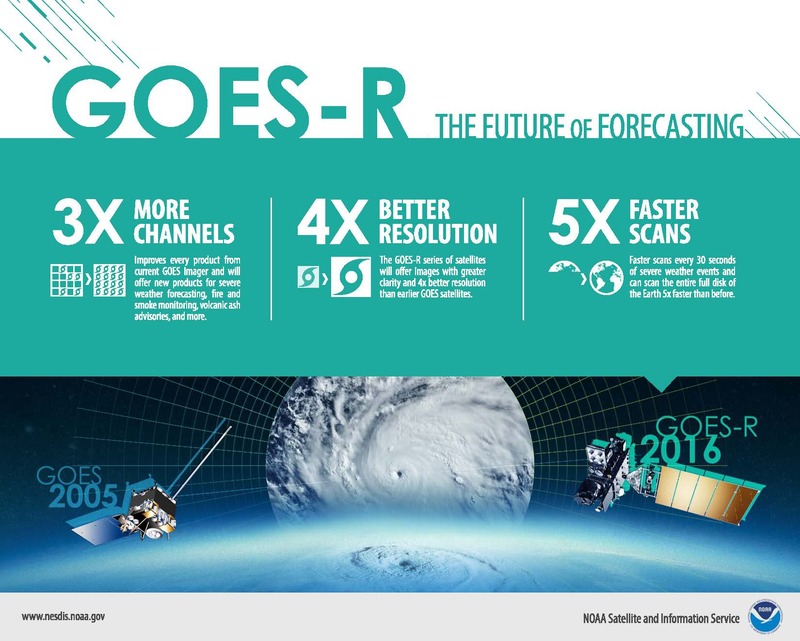 GOES-R will bring about a “quantum leap” in weather forecasting capabilities that will soon lead to more accurate and timely forecasts, watches and warnings for the Earth’s Western Hemisphere when it becomes fully operational in about a year. But the first images are expected within weeks! And both researchers and weather forecasters can’t wait to see, analyze and put to practical use the sophisticated new images and data that will improve forecasts and save lives during extreme weather events that are occurring with increasing frequency. GOES-R will be renamed GOES-16 after it reaches its final orbit 22,000 above Earth about two weeks from now. Over the next year, teams of engineers and scientists will check out and validate the state of the art suite of six science instruments that also includes the first operational lightning mapper in geostationary orbit – dubbed the Geostationary Lightning Mapper (GLM). “The launch of GOES-R represents a major step forward in terms of our ability to provide more timely and accurate information that is critical for life-saving weather forecasts and warnings,” said Thomas Zurbuchen, associate administrator for NASA’s Science Mission Directorate in Washington. The science suite includes the Advanced Baseline Imager (ABI), Geostationary Lightning Mapper (GLM), Solar Ultraviolet Imager (SUVI), Extreme Ultraviolet and X-Ray Irradiance Sensors (EXIS), Space Environment In-Situ Suite (SEISS), and the Magnetometer (MAG). So instead of seeing weather as it was, viewers will see weather as it is. Whereas the current GOES-NOP imagers scan the full hemispheric disk in 26 minutes, the new GOES-ABI can simultaneously scan the Western Hemisphere every 15 minutes, the Continental U.S. every 5 minutes and areas of severe weather every 30-60 seconds. “The next generation of weather satellites is finally here,” said NOAA Administrator Kathryn Sullivan. It is designed to last for a 15 year orbital lifetime. Today’s launch was the 10th of the year for ULA and the 113th straight successful launch since the company was formed in December 2006. GOES-R launched on the Atlas V 541 configuration vehicle, augmented by four solid rocket boosters on the first stage. The payload fairing is 5 meters (16.4 feet) in diameter. The first stage is powered by the RD AMROSS RD-180 engine. And the Centaur upper stage is powered by a single-engine Aerojet Rocketdyne RL10C engine. KENNEDY SPACE CENTER, FL – From both the technical and weather standpoint, the outlook is outstanding for Saturdays sunset blastoff of the NASA/NOAA GOES-R geostationary weather observation satellite that’s set to deliver a ‘quantum leap’ in weather forecasting on Nov. 19. Everything is progressing as planned toward liftoff of the school bus sized GOES-R weather satellite atop a United Launch Alliance (ULA) Atlas V rocket on Saturday, Nov. 19 at 5:42 p.m. from Space Launch Complex 41 (SLC-41) on Cape Canaveral Air Force Station, just about 17 minutes after sunset. “GOES-R offers a quantum leap above prior weather satellites, the greatest in 40 years,” said Steve Volz, assistant administrator, NOAA’s Satellite and Information Service, at the prelaunch news briefing at NASA’s Kennedy Space Center. It will collect 3 times more spectral data with 4 times greater resolution and scans 5 times faster than ever before – via the primary Advanced Baseline Imager (ABI) instrument instrument – compared to the current GOES satellites. The soar to space should be spectacular for locals and tourists gathering from around the world to view the launch now slated for less than 24 hours from now. The launch window opens at 5:42 p.m. The launch window extends for an hour from 5:42-6:42 p.m. EST. Following a short delay, the Atlas V with GOES bolted on top was rolled out to pad 41 this morning, Friday, November. 18. GOES-R is GO for launch. NASA’s GOES-R launch coverage will be broadcast on NASA TV beginning at 4:45 p.m. EDT Nov. 19. Coverage will conclude after spacecraft separation from the Centaur and the GOES-R solar arrays are deployed, which occurs approximately 3 ½ hours after launch. At that time the spacecraft initial state of health can be determined and will be confirmed on the air. There is no planned post-launch news conference. The weather forecast shows a 90 percent chance of favorable weather conditions for Saturday’s sunset blastoff. The primary concern is for cumulous clouds. In the event of a 24 hour delay, the weather forecast shows an 80 percent chance of favorable weather conditions on Sunday, Nov. 20. 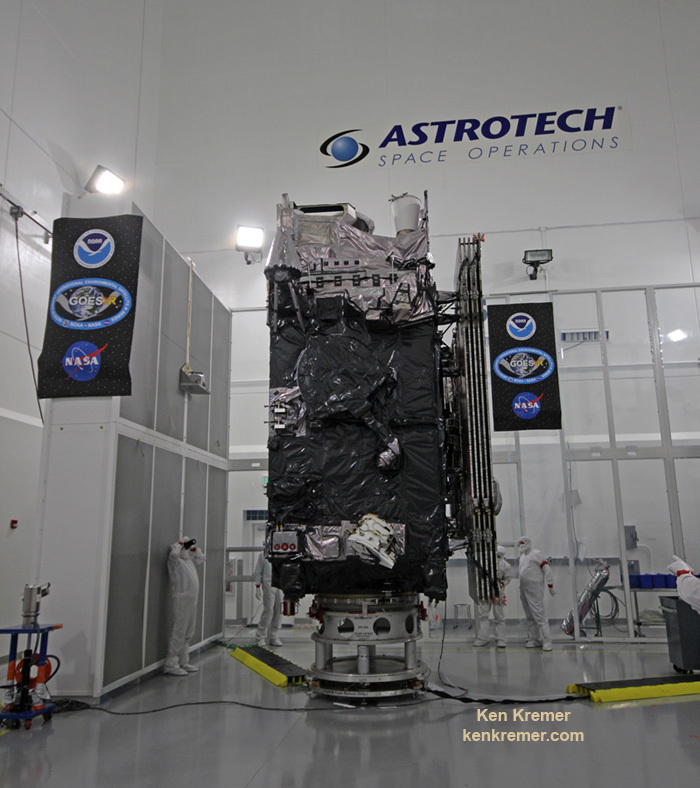 GOES-R is the first in a new series of American’s most powerful and most advanced next generation weather observation satellites. It is designed to last for a 15 year orbital lifetime. GOES-R will blastoff on a ULA Atlas V in the very powerful 541 configuration, augmented by four solid rocket boosters on the first stage. The payload fairing is 5 meters (16.4 feet) in diameter and the upper stage is powered by a single-engine Centaur. The gigantic school bus sized satellite is equipped with a suite of six instruments or sensors that are the most advanced of their kind. They will be used for three types of observations: Earth sensing, solar imaging, and space environment measuring. They will point to the Earth, the Sun and the in-situ environment of the spacecraft. The suite includes the Advanced Baseline Imager (ABI), Geostationary Lightning Mapper (GLM), Solar Ultraviolet Imager (SUVI), Extreme Ultraviolet and X-Ray Irradiance Sensors (EXIS), Space Environment In-Situ Suite (SEISS), and the Magnetometer (MAG). KENNEDY SPACE CENTER, FL – After an ironic detour due to Hurricane Matthew, liftoff of the game changing NASA/NOAA next generation GOES-R geostationary weather observation satellite offering a “dramatic leap in capability” is finally on track for this weekend on Nov. 19 from the Florida Space Coast. 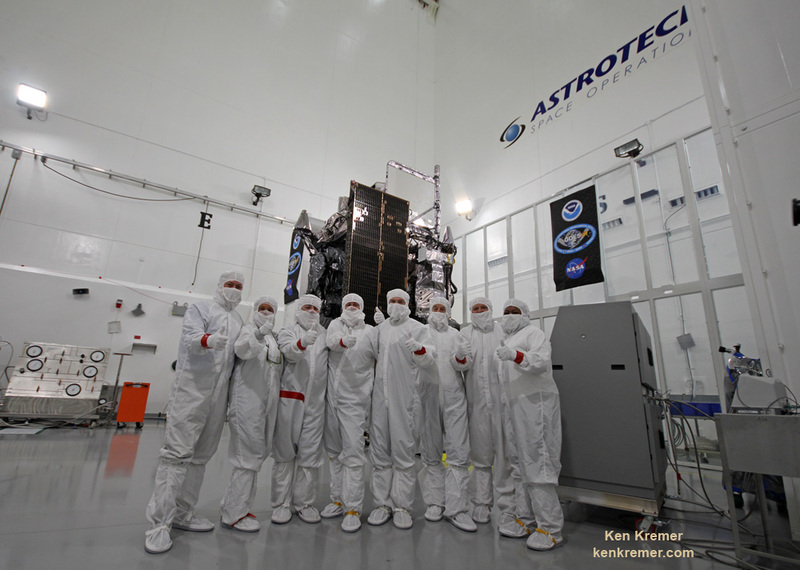 And Universe Today recently got an up close look and briefing about the massive probe inside the cleanroom processing facility at Astrotech Space Operations in Titusville, Fl. “We are bringing the nation a new capability .. that’s a dramatic leap .. to scan the entire hemisphere in about 5 minutes,” said Greg Mandt, NOAA GOES-R program manager during a briefing in the Astrotech cleanroom. “GOES-R has both weather and space weather detection capabilities!” Tim Gasparrini, GOES-R program manager for Lockheed Martin, told Universe Today during a cleanroom interview. The impact of deadly Cat 4 Hurricane Matthew on the Florida Space Coast on October 7, forced the closure of the vital Cape Canaveral Air Force Station (CCAFS) and the Kennedy Space Center (KSC) launch and processing vital facilities that ultimately resulted in a two week launch delay due to storm related effects and facilities damage. Liftoff of the NASA/NOAA GOES-R weather satellite atop a United Launch Alliance (ULA) Atlas V rocket is now scheduled for Saturday, Nov. 19 at 5:42 p.m. from Space Launch Complex 41 (SLC-41) on Cape Canaveral Air Force Station, shortly after sunset. Once in orbit it will be known as GOES-16. TV viewers are presently accustomed to seeing daily streams of imagery from the GOES-East and GOES-West weather observation satellites currently in orbit. What’s the big deal about GOES-R? Audiences will notice big changes from GOES-R once it becomes operational because it will provide images of weather patterns and severe storms as regularly as every five minutes or as frequently as every 30 seconds. “These images can be used to aid in weather forecasts, severe weather outlooks, watches and warnings, lightning conditions, maritime forecasts and aviation forecasts. 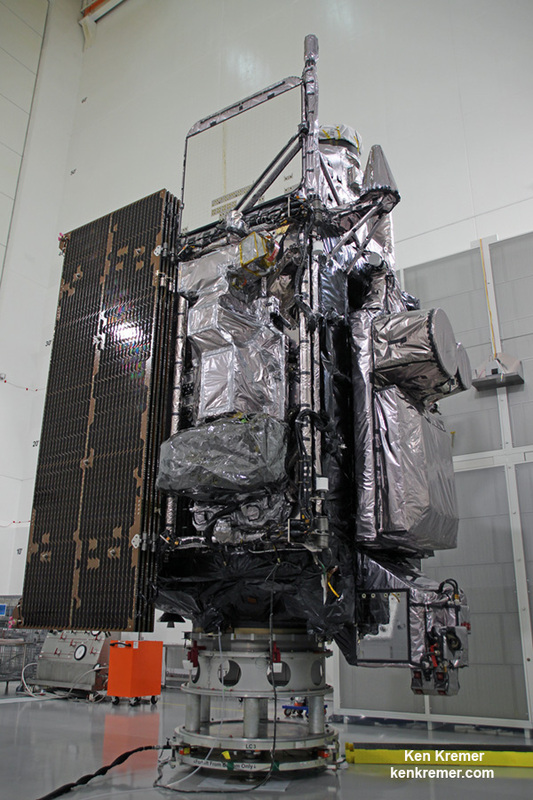 GOES-R was built by prime contractor Lockheed Martin and is the first of a four satellite series – comprising GOES-R, S, T, and U that will be keep the GOES satellite system operational through 2036. All four of the revolutionary 11,000 pound satellites are identical. The overall cost is about $11 Billion. It was built in facilities in Bucks County, Pennsylvania and Denver, Colorado. It arrived at Astrotech in August for final processing and checkouts of the spacecraft and instruments. The two Earth-pointing instruments are on the top of the spacecraft – namely ABI and GLM. “ABI is the premier instrument on the spacecraft. When you turn on the news and see a severe storm picture, that’s the one it comes from. It takes pictures in the visible as well as the infrared (IR), near infrared (IR),” Tim Gasparrini, GOES-R program manager for Lockheed Martin, told Universe Today during a cleanroom interview. ABI offers 3 times more spectral channels with 4 times greater resolution and scans 5 times faster than ever before, compared to the current GOES satellites. The GOES-R ABI will view the Earth with 16 different spectral bands (compared to five on current GOES), including two visible channels, four near-infrared channels, and ten infrared channels, according to the mission fact sheet. It will also carry the first operational lightning mapper ever flown in space – GLM – built by Lockheed Martin. It has a single-channel, near-infrared optical transient detector. “GLM takes a picture of a scene on the Earth 500 times per second. And it compares those images for a change in the scene that can detect lightning, using an algorithm,” Gasparrini told me. GLM will measure total lightning (in-cloud, cloud-to-cloud and cloud-to-ground) activity continuously over the Americas and adjacent ocean regions with near-uniform spatial resolution of approximately 10 km. The instruments work in concert. “So GOES-R has both weather and space weather detection capabilities!” Gasparini elaborated. The huge bus sized satellite measures 6.1 m x 5.6 m x 3.9 m (20.0 ft x 18.4 ft x 12.8 ft) with a three-axis stabilized spacecraft bus. It has a dry mass of 2,857 kg (6,299 lbs) and a fueled mass of 5,192 kg (11,446 lbs) at launch. The instruments are very sensitive to contamination and the team is taking great care to limit particulate and molecular contaminants in the cleanroom. Some of the instruments have contamination budget limits of less than 10 angstroms – smaller than the diameter of a typical molecule. So there can’t even be a single layer of molecules on the instruments surface after 15 years on orbit. GOES-R can also multitask according to a NASA/NOAA factsheet. The Atlas V booster has been assembled inside the Vertical Integration Facility (VIF) at SLC-41 and will be rolled out to the launch pad Friday morning, Nov. 18 with the GOES-R weather satellite encapsulated inside the nose cone. The weather forecast shows a 80 percent chance of favorable weather conditions for Saturday’s sunset blastoff. SpaceX’s key launch facilities on the Florida Space Coast escaped the wrath of Hurricane Matthew’s 100 mph wind gusts late last week, suffering only some exterior damage to the satellite processing building, a company spokesman confirmed to Universe Today. Furthermore, the aerospace firm still hopes to resume launches of their Falcon 9 rocket before the end of this year following September’s rocket explosion, according to remarks made by SpaceX President Gwynne Shotwell over the weekend. “Hurricane Matthew caused some damage to the exterior of SpaceX’s payload processing facility [PPF] at Space Launch Complex-40 at Cape Canaveral Air Force Station,” SpaceX spokesman John Taylor told Universe Today. The payload processing facility (PPF) is the facility where the satellites and payloads are processed to prepare them for flight and launches on the firm’s commercial Falcon 9 rockets. Some exterior panels were apparently blown out by the storm. The looming threat of a direct hit by the Category 4 storm Hurricane Matthew on Friday, Oct. 7, on Cape Canaveral and the Kennedy Space Center (KSC) forced the closure of both facilities before the storm hit. They remained closed over the weekend except to emergency personal. The deadly storm also caused some minor damage to the Kennedy Space Center and USAF facilities on the base. 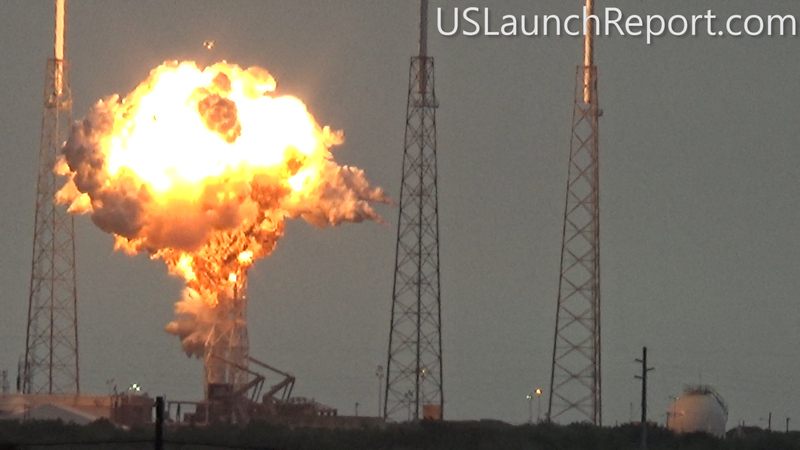 Meanwhile competitor ULA also told me their facilities suffered only minor damage. However the base closure will likely result in a few days launch delay of the ULA Atlas V rocket carrying the NASA/NOAA GOES-R weather satellite to geostationary orbit, which had been slated for Nov. 4. The PPF is located on Cape Canaveral Air Force Station, a few miles south of the Falcon 9 launch pad at Space Launch Complex-40 (SLC-40). The PPF is inside the former USAF Solid Motor Assembly Building (SMAB) used for the now retired Titan IV rockets. Fortunately, SpaceX has another back-up facility at pad 40 where technicians and engineers can work to prepare the rocket payload for flight. “The company has a ready and fully capable back-up for processing payloads at its SLC-40 hangar annex building,” Taylor elaborated. And except for the minor damage to the PPF facility where payloads are processed, SpaceX says there was no other damage to infrastructure at pad 40 or to Launch Complex 39A at the Kennedy Space Center. “There was no damage the company’s facilities at Pad 39A at Kennedy Space Center,” Taylor told me. However SLC-40 is not operational at this time, since it was heavily damaged during the Sept. 1 launch pad disaster when a Falcon 9 topped with the Israeli Amos-9 comsat exploded on the launch pad during a routine prelaunch fueling operation and a planned first stage static fire engine test. As SpaceX was launching Falcon 9 rockets from pad 40, they have been simultaneously renovating and refurbishing NASA’s former shuttle launch pad at Launch Complex 39A at the Kennedy Space Center (KSC) which they leased from NASA. SpaceX plans to start launching their new Falcon Heavy booster from pad 39A in 2017 as well as human rated launches of the Falcon 9 with the Crew Dragon to the ISS. However, following the pad 40 disaster, SpaceX announced plans to press pad 39A into service for commercial Falcon 9 satellite launches as well. SpaceX President Gwynne Shotwell recently said that the company hoped to resume launches in November while they search for a root cause to the pad 40 catastrophe – as I reported here. Speaking at the annual meeting of the National Academy of Engineering in Washington, D.C. on Oct. 9 Shotwell indicated that investigators are making progress to determine the cause of the mishap. Space News said that she did not elaborate further. The imminent impact of the already deadly Category 4 Hurricane Matthew along the Florida Space Coast tonight, Thursday, October 6, has forced the closure of NASA’s Kennedy Space Center (KSC) and mass evacuations along the US East coast from Florida, to Georgia to the Carolinas. “Hurricane Matthew, currently an extremely dangerous Category 4 storm on the Saffir-Simpson Hurricane Wind Scale, continues to bear down on the southeastern United States,” says NASA in an update today. NASA has closed KSC for today and tomorrow, at a minimum and the center has entered HurrCon 1 status. “Under the current storm track, peak winds are forecast to be 125 mph sustained with gusts to 150 mph, however a shift in the track even slightly could improve the wind forecast somewhat,” wrote NASA’s Brian Dunbar. The Kennedy Space Center on Florida’s Space Coast is home to the iconic Vehicle Assembly Building (VAB) – the most well known building at NASA – as well as Launch Complex’s 39 A and B which launched American astronauts to Moon and thereafter Space Shuttles for three decades. The launch pads sit precariously close to the Atlantic Ocean shoreline – just a few hundred yards (meters) away! “Across the spaceport, essential personnel are preparing facilities for the storm’s arrival,” according to George Diller, NASA Kennedy Space Center Public Affairs Officer. The last time a major Hurricane impacted near KSC and the Space Coast was in 2004. The VAB suffered some outside damage. The Kennedy Space Center Visitor Complex is also closed on Thursday, October 6 and Friday, October 7. Hurricane Matthew is bearing down on the US East Coast right now at Florida’s Peninsula and is tracking north. Herein is the latest satellite imagery from NASA and NOAA of this evening. Mass evacuations have been ordered and States of Emergencies declared by the Governors of Florida, Georgia and North and South Carolina. The high winds, storm surge of potentially 5 to 11 feet, drenching rains and extensive flooding is expected to cause massive damage and devastation to homes, businesses and infrastructure. Hundreds of thousands of folks have left their home over the past 2 days. Many gas stations are dry and grocery store shelves emptied. Matthew will cause a wide swath of destruction and potentially deaths along hundreds of miles of US shoreline and inland areas as the massive storm hugs the coast like none before in recorded history. Furthermore, hundreds of thousands of folks are expected to lose power as well, for days and perhaps weeks. Hundreds of deaths and massive destruction in Haiti, Cuba and elsewhere in the Caribbean can already be blamed on Hurricane Matthew – a storm like none other and by far the worst since Superstorm Sandy and Hurricane Katrina. After the storm passes KSC will evaluate all its facilities. “Once the storm has passed, center facilities and infrastructure will be assessed and employees will be cleared to return when it is safe to do so,” Diller. Indeed NASA was preparing to launch America’s newest and most advanced weather satellite on Nov 4. 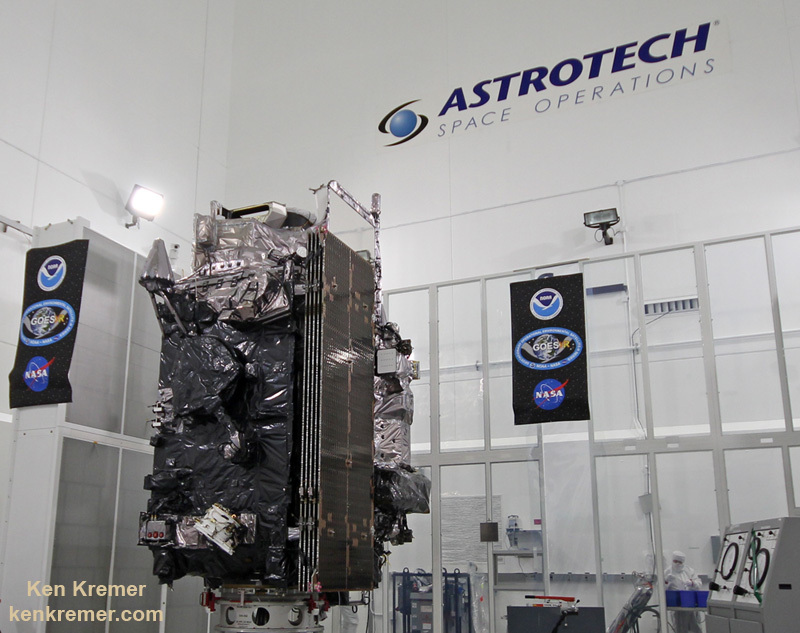 It’s named GOES-R and was slated for blastoff from Cape Canaveral Air Force Station atop a ULA Atlas V on Nov. 4. The launch facilities will have to be thoroughly inspected before the launch can proceed. Titusville and Astrotech could suffer a direct hit from Matthew. But the satellite has been secured. Here is the latest Advisory from the National Hurricane Center (NHC) as of 8 PM EDT Oct 6. At 800 PM EDT (0000 UTC), the eye of Hurricane Matthew was located over the western end of Grand Bahama Island near latitude 26.6 North, longitude 78.9 West. The hurricane is moving toward the northwest near 13 mph (20 km/h), and this general motion is expected to continue tonight with a turn toward the north-northwest early Friday. On the forecast track, the eye of Matthew should move away from Grand Bahama Island during the next few hours, and move close to or over the east coast of the Florida peninsula through Friday night. Reports from a NOAA Hurricane Hunter aircraft indicate that maximum sustained winds are now near 130 mph (210 km/h) with higher gusts. Matthew is a category 4 hurricane on the Saffir-Simpson Hurricane Wind Scale. Some fluctuations in intensity are likely while the hurricane moves toward the coast of Florida. Hurricane-force winds extend outward up to 60 miles (95 km) from the center and tropical-storm-force winds extend outward up to 185 miles (295 km). Settlement Point in the Bahamas recently reported a sustained wind of 79 mph (128 km/h) with a gust of 105 mph (169 km/hr). The Lake Worth Pier near Palm Beach, Florida, recently reported a sustained wind of 46 mph (74 km/h) and a wind gust of 60 mph (96 km/h). The minimum central pressure estimated from NOAA Hurricane Hunter data is 939 mb (27.73 inches). The latest weather briefing indicates that “tropical storm force winds beginning at Cape Canaveral tonight at midnight with hurricane force winds starting at about 6 a.m.
A hurricane ride-out crew of 116 has arrived at KSC this evening to prepare for Matthew. 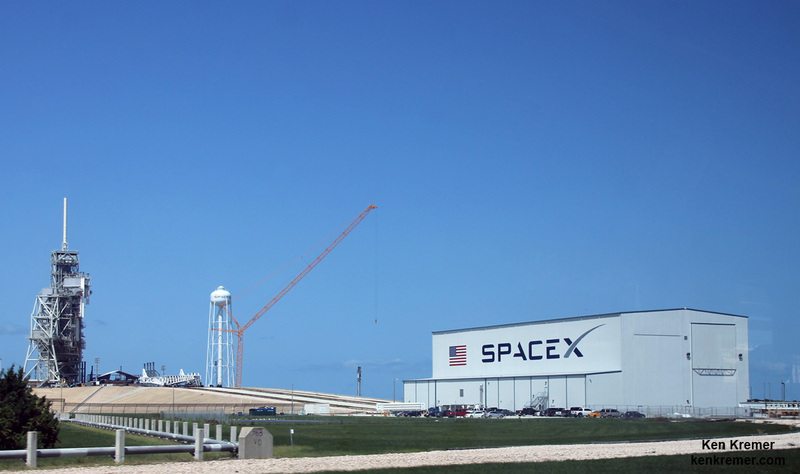 SpaceX is currently renovating and refurbishing pad 39A to launch their commercial Falcon 9 and Falcon Heavy rockets as well the Crew Dragon with astronauts on mission to the ISS. The eye of the storm is barreling towards KSC at this moment. Stay tuned for the outcome.